A bus stop ad has been developed that uses facial-recognition technology to tell whether the person looking at it is male or female; delivering a different message dependent of the person’s gender. The electronic hoarding, to be unveiled for two weeks on a bus stop in London’s Oxford Street this week, plays a 40-second advertisement, which only women will be able to watch the whole of. Media including the Independent on Sunday, the Mail Online, The Telegraph, The Guardian and many others have featured the ad, proving that an innovative approach can tick many marketing boxes. The ad is for charity Plan UK who aim to promote female education worldwide. The narrative says that the ad hopes to show men ‘a glimpse of what it’s like to have basic choices taken away’. 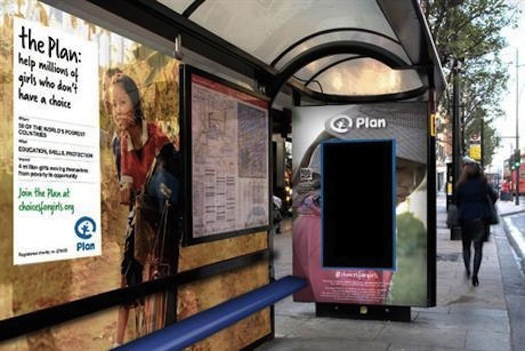 Outdoor ad firm Clear Channel are behind the placement, while the idea was masterminded by one of my clients, CURB, who deliver and have delivered creative ad campaigns for brands including Sky, Microsoft, Sony, Warner Bros and many more.